I was standing in front of a crowd of expectant faces at Harry’s Restaurant in Inishowen, just about to launch into a description of Helvick Gold, chosen to accompany our shellfish and seafood course, when I realised that the liquid in the glass I was holding up was more opaque than Dungarvan’s fine brew should have been. Cue a speedy dash back to my table to reclaim my beer – and train of thought! – before explaining why I had picked the crisp, full-flavoured Helvick Gold for the Inishfood No Menu Feast. Much more suitable than juice. Last March, when I made that first epic trip to Harry’s Restaurant for the inaugural Inishfood festival, it was as one half of the Irish Food Bloggers Association organising team, Twitter fanatic and interested punter. This year, with Sister’s car loaded up with boxes of Eight Degrees beer for the six hour drive, I added producer to the list. Work, for me, of a very relaxed kind, started straight away. Darren Bradley, wood fired oven fanatic and producer of the memorable pizzas from last year, was back at work for Friday night, turning numerous balls of dough into hot, chewy and tasty pizza from his oven at the back of the Drift Inn. 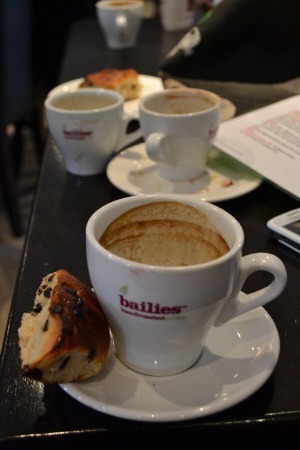 Coffee refreshment was on hand from Caffe Banba while inside I conducted an Irish craft beer and cider tasting. It was a warm and appreciative crowd, getting more interactive as the evening (and beer!) continued. We stormed our way through four beers – our own Howling Gale, the Franciscan Well‘s Alpha Dawg, Copper Coast from Dungarvan Brewing Company and Knockmealdown Porter, again from Eight Degrees – and then had the opportunity of comparing and contrasting two ciders from Cork: Stonewell and Longueville House. 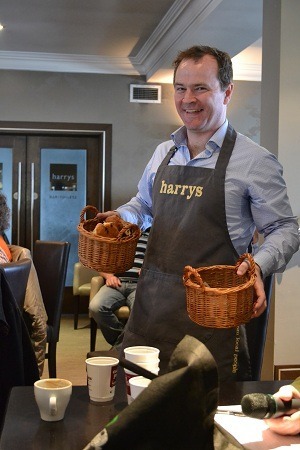 Saturday was spent at Harry’s Restaurant, surrounded by fellow food lovers for a day of sharing, learning and tasting. Karl of Coffee Angel and Ross from Bailies Coffee were on hand to extol the virtues of grinding on demand and pointing out the importance of a digital scale in making coffee (key recipe: 30g freshly ground beans to 500mls water). We all went home with a bag of Kii AB from Rung’eto Coop in Kenya, an addictive single estate coffee to brighten up post-Inishfood mornings. The coffee wasn’t the only appetising aroma; with a bread oven temporarily installed in the dining room, Thibault Peigne led the campaign for real bread by example, baking an array of sourdough loaves (key recipe: 400g sourdough per 1kg of flour, 65% hydration) and a chocolate brioche for morning coffee. Ed Hick brought chewing gum, apples and jaffa cakes as part of his exploration of the senses, Dorcas Barry set up her smoothie maker and launched September’s Dianne Jacob food writing workshop, Vinnie Sheehy spoke of the time he spent in Sweden, working with Noma veg supplier Søren Wiuff and there was a serious discussion on the future of Irish fish, chaired by For Food’s Sake‘s Aoife Carrigy (key website: www.fishmongers.ie). Unexpected taste of the day? An Irish snail from Colin Peck, Harry’s forager, with a texture like lamb’s kidney, cooked with oodles of butter and copious amounts of garlic (key foraging video: Colin goes mushroom hunting here). That night, chef Ray Moran produced an outstanding meal, using ingredients that had been locally foraged, sourced from Inishowen or gathered from Harry’s own walled garden. 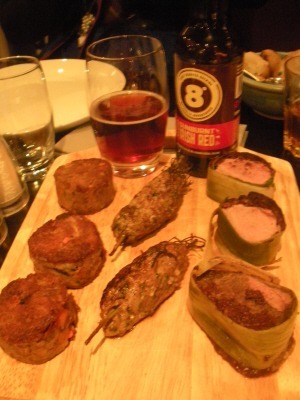 I had picked the Irish craft beers to match the food, talking about my choices between courses – and that was when I almost came a cropper with the apple juice. Mistake swiftly rectified amidst much laughter, we were back on track for the rest of the dinner, drinking Alpha Dawg, Helvick Gold, Sunburnt Irish Red and Black Arts with the array of food that streamed out of the kitchen. I was a little distracted by the beer presentation, but few of the standout dishes for me were Glebe Brethan Rarebit, the nettle and spinach gnocchi, a choice piece of beautifully cooked red mullet and the sirloin of Dexter beef. The meal finished with an Arctic Roll-style sponge-wrapped buttermilk sorbet, a light ending to a day of indulgence, inclusion and all round good fun. Why does a small food event in the far North of Donegal work so well? It’s because of passion and commitment. 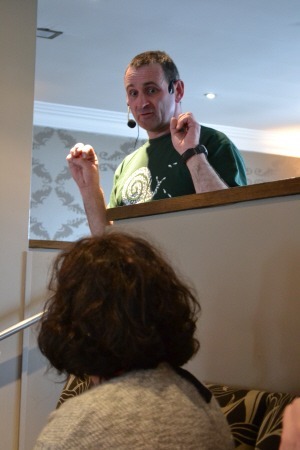 From the impeccably trained staff at Harry’s to the guesthouses that made us all so welcome (thumbs up to Linsfort Castle once again), the participants who travel long distances to be there and, most of all, organiser extraordinaire Donal Doherty, every person at Inishfood is passionate about food, is committed to being there and is actively involved.